My favourite rose garden isn’t in the green countryside of England or on the outskirts of Paris or even in an area of Australia known for rose growing. No, it’s in a country town in the Great Southern Region of Western Australia about 260 km south east of Perth. The town is called Kojonup and it is the centre of a canola, wheat and sheep farming district. 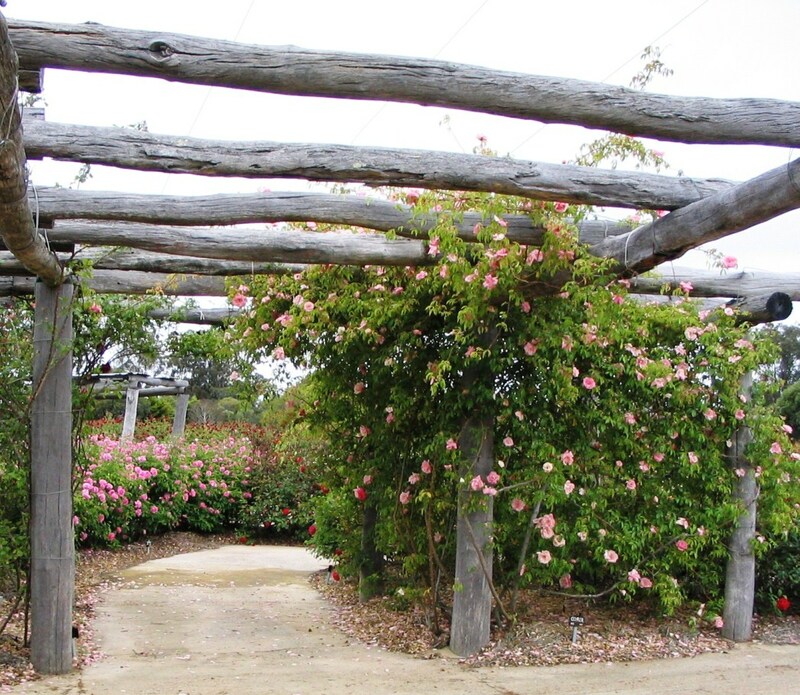 The garden is the Australian Rose Maze which is part of The Kodja Place, a cultural centre housing a museum, galleries and the Visitor Centre. The reason I like the Rose Maze so much is that it combines not only a stunning floral display but also the history and community spirit of the district into a unique and delightful garden. 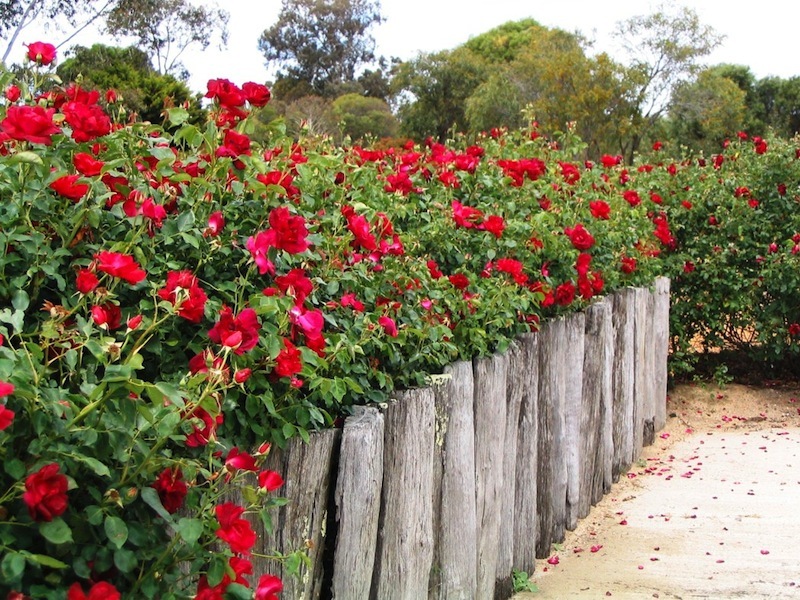 The idea of a rose garden was floated when the Kojonup Council and the community were looking at ways to commemorate the Centenary of Federation in 2001. Cathy Wright promoted the development of the rose garden as co-ordinator and manager and she invited local rose grower Penny Young to be involved. Penny came up with the idea of a maze and designed it brilliantly, incorporating a lot of symbolism and various themes into one integrated design. She also selected the Australian bred roses which are able to cope with the hot and dry conditions that prevail for 4 months of the year. 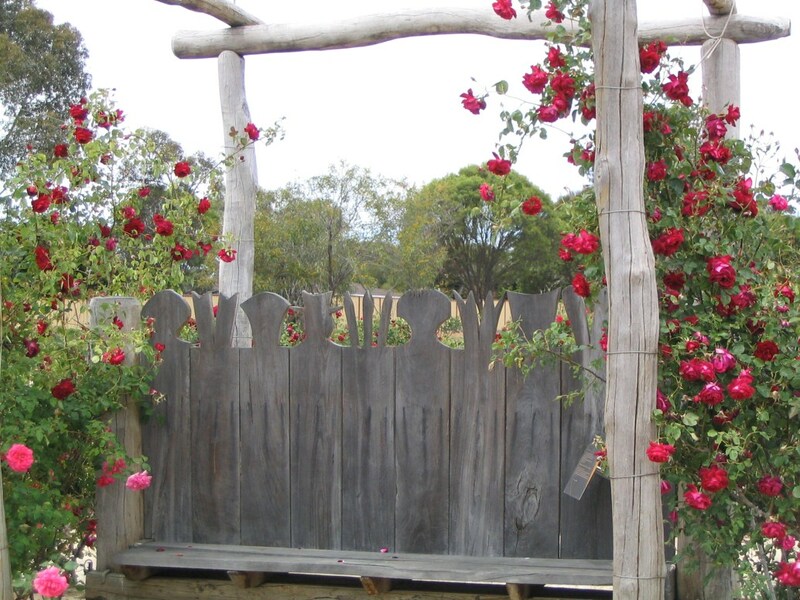 These hardy roses contribute to the uniqueness of the garden but it is the combination of the roses with the use of lovely weathered timber and the stories of the community that can be traced by walking through the maze that make it truly unique. The various strands of the collective community history are expressed in the stories of three fictional women, Yoondi – a Noongar woman representing the original inhabitants of the district, Elizabeth representing English settlers and Maria representing the Italian migrants. 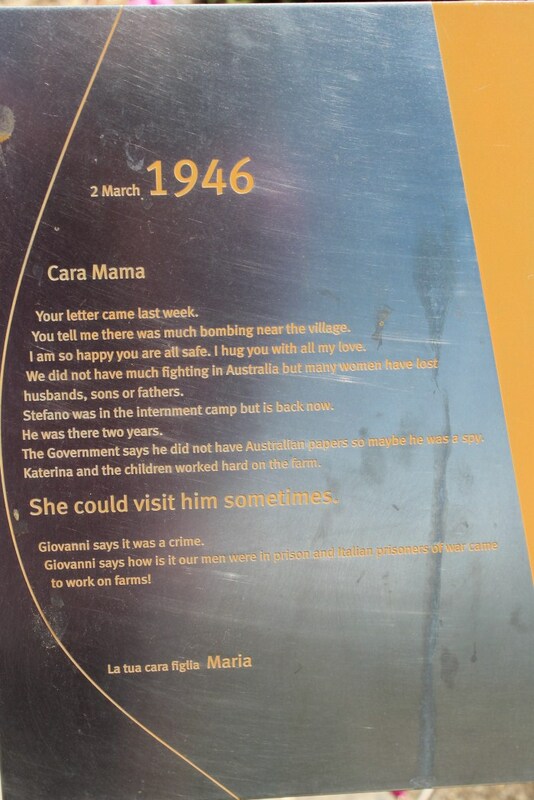 Their stories are told on plaques placed throughout the maze and they give a very moving personal insight of what life was like in Kojonup during the last century. The timber for the structures was donated and then volunteers used it to construct interesting arbours, seats, fences, gazeboes and various structures throughout the maze. 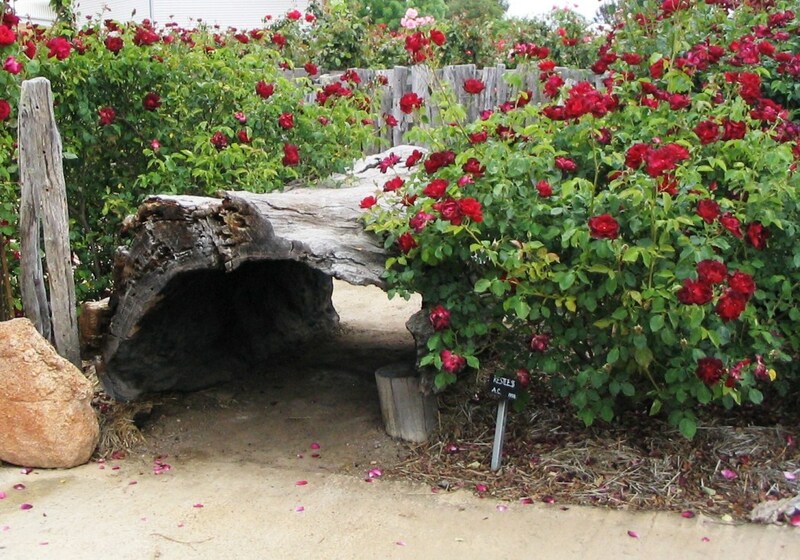 Some, like the hollowed out log, are used to make interesting little short cuts for kids walking the maze. Most of the structures are made of gorgeous weathered silver grey timber but unfortunately not all of them are. As the stories of the women unfold through the decades the structures reflect the style of that decade. Remaining true to history has introduced a few jarring structures – the 1970s pergola for instance, painted in Mission Brown looks so out of place in an otherwise harmonious scene. The angles, the thickness of the timber and the colour clash badly with the older style structures. While I respect the reasoning for it I wish that the newer pergolas were less dominant – perhaps planting a few vigorous climbing roses would soften the impact. 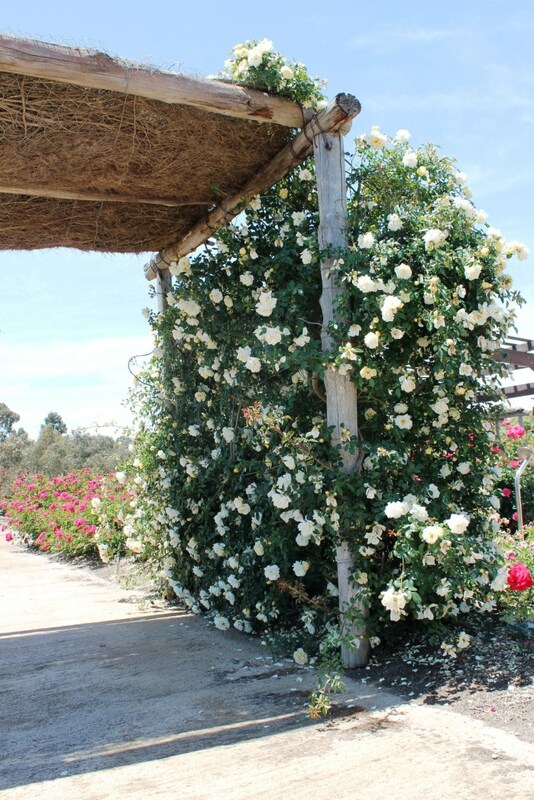 Like the structures, the roses selected are appropriate to each decade with over 100 varieties represented, including 32 bred by renowned Australian rose breeder Alister Clarke. There are a few Western Australian varieties including the stunning China Doll Climbing (syn Weeping), a sport of China Doll discovered by rosarian Bob Melville in his nursery in the Perth hills in 1974. It is grown here as a weeping standard. When the roses are at their peak the display is really magnificent, as is the perfume. Many repeat flowerers were chosen so there is colour over a long period from spring to autumn. 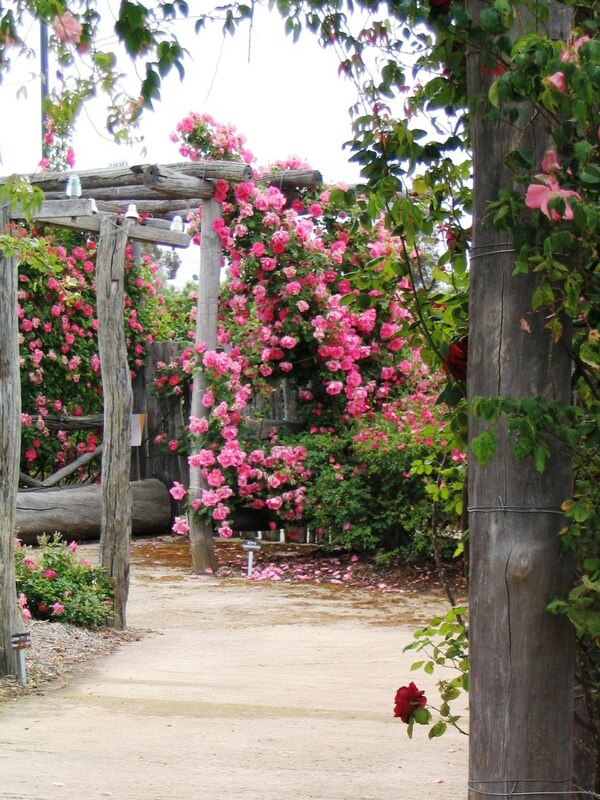 If you are driving between Perth and the south coast via the Albany Highway the Kojonup Rose Maze is definitely worth stopping for. 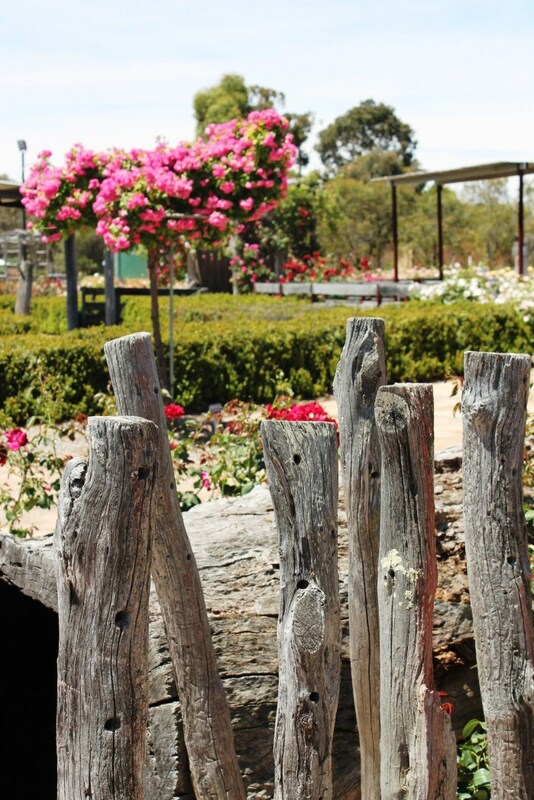 Even if the roses aren’t in full bloom you can meander through the maze admiring the beautiful timber and reading about life in Kojonup last century. Rosa ‘Editor Stewart’??? Are you kidding me? Where do I get one?! Thank you Linda for highlighting one of our cultural “treasures” in WA. I was fortunate recently to catch up with Cathy Wright in the Rose Garden and was thrilled to hear of the future plans, the past effort and constant commitment of the Kojonup locals to maintaining their commemorative garden. And Stuart is right, the Museum alongside is brimming with stories and insights into Kojonup’s history. Well worth a dedicated visit or just a brief stop off on your way through to or from the south coast. I look forward to discovering what the “future plans” for the Maze will be. Yes Kojo is certainly a great little spot. The area is endowed with natural beauty and lots of wildflowers. The Kojonup Spring is a lovely place for a picnic and the wildflower display at the annual Wildflower and Bloom Festival features some amazing orchids. What a beautiful place! I really like the idea of incorporating the roses into a meaningful interpretation of the areas culture instead of just using them as a garden. I think it’s a wonderful idea. The above garden will definitely go onto my ‘must visit’ list when we eventually finish our landscaping and set off on a trip along the coast to WA. Thank you Linda for sharing this beautiful garden with others. I’m glad that you are still planting roses. Since the introduction of water restrictions and the proliferation of small house lots many people have been put off from planting them but as you have found they are so rewarding to grow and there are varieties to suit most conditions. Catherine if any deserves to have an Editor Stewart its you. I know Melville’s Rose Nursery has grown it in the past but I’m not sure if it is on their current list. As it is an Alister Clarke rose I’m sure you could order it from a nursery in your neck of the woods. What a lovely post. I have just added this place to a must visit list I am compiling for our trip to WA next month. We will be heading from Perth to the Margaret River , so guess it’s sort of on the way? Or a short detour? I have rosy envy as mine are looking healthy but I get too few blooms… think I must have selected the wrong varieties. Am writing down your species and will replant accordingly. I don’t know about a “short detour” – there is no direct road between Margaret River and Kojonup. I am guessing it could take a minimum of 3hrs driving depending on which route you take. Once you reach Kojo there is a highway straight back to Perth (about 3hrs). Both MR and Kojo have Visitor Centres. I would double check with a specialist Rose nursery in your area to confirm that these varieties are suitable for your conditions. Thanks Linda for highlighting this delightful garden (and town). I had the joy of visiting it with the Australian Garden History Society on its post-conference tour in 10/2014 and it was a highlight. I usually lack patience with rose gardens but agree – the personal angle on these three women – quotes from their diaries, letters, direct connections to place, people and plants won me over – not to mention the shag pile carpets of rose petals, rusticity of the pergolas and general gutsiness of the whole ‘hang’- I think there’s plenty of life in Kojonup yet – some ratbags and energy locally, well worth a visit. And that terrific local museum right next to it – again humming with life, stories and relevance. Bravo!